"Movement" is a word that describes travel per se. But "circulation" - movement with return proceeding along definable pathways and with perceptible rhythm - captures travel and hospitality taken together. The natural question is, "What circulates?" Continue reading Critical Intersections in the Study of Tourism. The Declaration of Quito offers a rich starting point for a human rights-based argument supporting Inclusive Destination Development. Continue reading The Declaration of Quito. Senior and disabled travelers are among the first to come to mind as beneficiaries of universal design. These two large market segments have differing needs, differing self-understandings - sometimes even when they overlap. Research on seniors as consumers is more plentiful than similar information on consumers with disabilities. But the gap will continue to close as universal design thinking continues to influence the travel industry drawing more of this demographic into the market. The academic fields researching both groups -- gerontology or Aging Studies and Disabillity Studies -- have a part to play in guiding the industry. What is the scope of the newer field, Disability Studies? There are many definitions of destination management. The UN document Agenda 21 is a formative document if the approach is to be credibly eco-sensitive. Inclusion of persons with disabilities as stakeholders and participants is essential if it is to be sustainable and not subject to retrofit. Here is a model for destination development used by Gordon Sillence President of the Instituto Portugues de Ecologia (INPECO). Continue reading A Model for Destination Management. The Asian and Pacific Decade of Disabled Persons, 1993-2002 resulted in publication of a collection of best practices in inclusive travel in the region. A selection can be found under Decade Best Practices Documents and in the document, Pathfinders: Towards Full Participation and Equality of Person with Disabilities in the ESCAP Region (Social Policy Paper No. 2). Continue reading Asian Pacific Best Practices in Inclusive Travel. Reading UN documents seems about as engaging as reading the Manhattan phone directory but ocassionally something pops out. Continue reading Inclusive Travel - Asia Pacific Region. eTurbo News has a report on the senior tourism market in its latest issue. Continue reading Trang web cá cược trực tuyếnSenior Market Tourism for Seniors on the Rise. Patria de Cadeiras (Homeland of the Chairs) is an articulate reflection by Eduardo Ferraz. The article was written after the 2000 Paralympic Games where Brazil came home with six Gold Medals, ten Silver Medals, and six Bronze Medals. Ferraz makes the point that international sports competition is no sweat compared to the daily marathon of living in a built environment where Universal Design is ignored. Those crafting Brazil's new Plano de Turismo would do well to re-read its stated commitment to promoting social inclusion and enabling internal tourism by Brazilians -- it is not only, not even primarily, for international tourists that the industry must design. Brasil ja ? "Patria de cadeiras" e com aquele barco de rodas, como todo o mundo sabe, " Navegar ? preciso!" Continue reading An Editorial on Life in a Wheelchair (in Portuguese). I have just discovered a blog that deserves a closer look: Yellow Door Selectors...Manual --- Travel, Tourism, Development.To be more accurate, the blog author discovered the Rolling Rains Report and posted a most gracious review, "Rolling Rains Weblog." I am several days late in discovering it. Thank you. Continue reading Yellow Door Selectors. Katja at Brokenclay Journal has begun an analysis of current initiatives to update disaster and evacuation policies. From her initial results it does not appear that we will hear shouts of "Women and children first!" at the next big disaster. 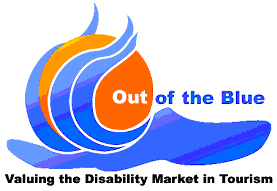 For background on he issue read the January 2004 news item at the National Organization on Disability. Continue reading Disaster Preparedness & Disability. E-Voting Previews E-Ticket Kiosk Problems? Sometimes running a Google search on your own name can be embarrassing - especially if you have a common name and you think someone else's ideas will be erroneously attributed to you. Fortunately my name is not all that common but coming across such a rousing endorsement of the Rolling Rains Report as Terry Welker has posted at The Code Connection was humbling. Continue reading Editorial on the Rolling Rains Report. The 5th National NICAN Conference will be held at the Rendezvous Observation City Hotel in Perth, Western Australia from September 20 - 22, 2004. Continue reading Conference on Disability and Travel in Australia. Continue reading Resources on Inclusive Travel for Professionals in Spanish. 360, The Accesssible Lifestyle Magazine, runs a weekly news roundup service online. This week features a report of a court case that may have broad application to seating at public events. Continue reading Cultural Access for Disabled. Travel Agent or Do It Yourself? Rod Nordland, in Have Agent, Will Travel suggests that you're better off using a professional. USA Today reports that, as of today, US airlines must have defibulators aboard. Continue reading Making Adaptive Equipment Standard - Mandating Inclusive Travel. We know that Boomers have always left their own stamp on the consumer market. As the cohort ages it is driving new products and approaches. One area of impact is travel. But their attitudes toward disablement in other realms ought to be given full attention by those in the travel and hospitality field. Something new is going on. Continue reading Boomers Sidestep Adaptive Equipment. GreatEscapeTravel.com lists their top ten reasons for using a travel agent in he article, Why Use a Travel Agent? Continue reading Reasons to Use a Travel Agent. Continue reading Destination Development Advice. UD in Paris - Segway Tourism for Aging Boomers and the "Hip at Heart"
City Segway Tours of Paris hs broken the mold -- high-tech, high-touch, high-"cool" travel for ambulatory people-who-don't know-they-have-a-disability. That's the beauty of ubiquity. The flexibility of the ICF. Universal design means you are not stigmatized. In this case in fact, you're pretty hip! Continue reading UD in Paris - Segway Tourism for Aging Boomers and the "Hip at Heart". One component of Universal Design is Assistive Technology. Some thought leadership that is taking place in the residential market may find application in the hospitality industry. For now efforts focused on aging-in-place are stimulating innovation. Continue reading Technology for Smart Homes. The World Tourism Organization will hold the conference, Creating Frameworks for Research and Education in Tourism Policy and Destination Management in Madrid, Spain on June 2-3, 2004. Continue reading Models of Inclusive Destination Development. Universal Design and The Rolling Stones Farewell Tour? Universal Design with a "funny bone". "The Rolling Stones Farewell Tour: Preparing Terminal Facilities for Today's Aging Population." Continue reading Universal Design and The Rolling Stones Farewell Tour?. I spent today touring Holland America Line's 1 year-old luxury liner, Oosterdam, in port in San Francisco. Corporate staff gave a presentation on their $225 million "Signature of Excellence" fleet makeover that will focus on five areas identified by passengers as priority features: Dining, Accommodation, Service, Activities, and Destinations. Apparently, people with disabilities are not among those the company identified as "passengers" when they did their research on what would constitute excellence. Being in a wheelchair I was frequently told how many disabled passengers cruise with them. That is, their passenger lists demonstrate the continuous demand and their bottom line makes the economic argument in passenger fares . Yet no one from VPs presenting to the ship's crew seemed to have a grasp of UD - and the concept of visitability was completely foreign to them. For example, the two high-end suite classes were barrier-rich and unliveable from a wheelchair while the few accessible lower-end suites and cabins incorporated crude retrofits. Continue reading HAL Pleads "No Lo Contendere" With its New Ship. The American Society of Travel Agents (ASTA) sponsors a useful web site - TravelSense.org One article addresses a common question, in this time of online everything, "Why use a travel agent?" Continue reading Why Use a Travel Agent?. Quality, accurate, and accessible information is essential to the traveler. Continue reading Guido Gybels @ Royal National Institute for Deaf People. The purpose of the da Vinci Award is to "honor exceptional design and engineering achievements in accessibility and universal design to empower people of all abilities." Nominations are open. Continue reading Nominate for the da Vinci Awards.